THE European Patent Office (EPO) has long granted patents in defiance of the EPC and Parliament? Who’s to stop it? It’s structurally above the law, as it has even demonstrated in the highest Dutch court. Who can compel António Campinos to stop granting software patents in Europe? The Parliament/Commission asked for that to stop and it also asked for patents on life/nature to no longer be granted. Did the EPO listen? No, it only pretended to. To keep up appearances. “The Parliament/Commission asked for that to stop and it also asked for patents on life/nature to no longer be granted. Did the EPO listen? No, it only pretended to. To keep up appearances.”Well, a new paper has just been published [1, 2] to deal with some profound questions. Its author, writing in Twitter this week, spoke of ‘unitary’ patents among other things. 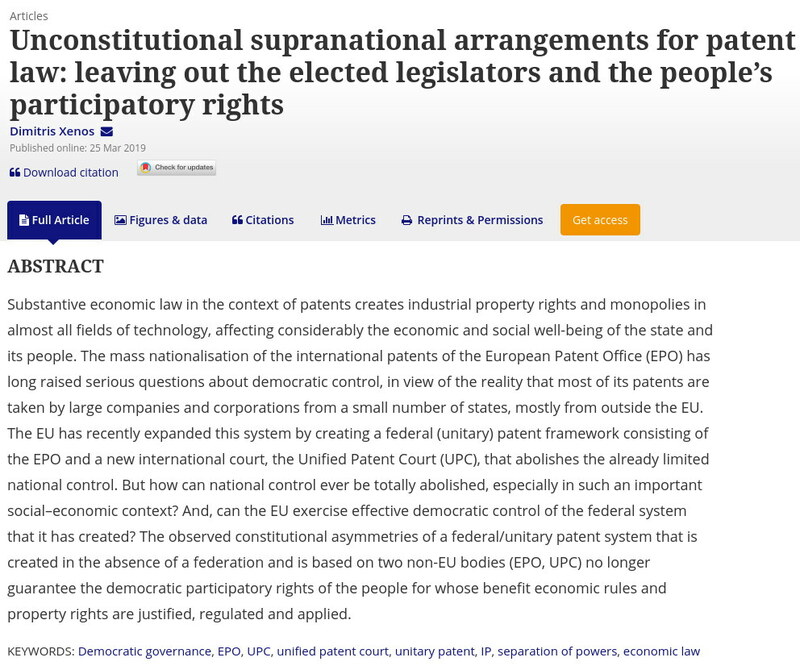 It’s “a constitutional examination of the European patent system as well as of unitary patent,” he summarised. Remember that the UPC has already been ruled unconstitutional in the Hungarian court. For Germany this ruling is an ongoing affair. No other country even checked! They didn’t bother checking the constitutional status of what they’re ratifying. Pressure group No Patents on Seed’s report covering conventionally bred patents granted by the European Patent Office (EPO) called for an end to “the legal chaos”. The report details the plant patents granted by the EPO in 2018 and at the beginning of this year. It called for an end to “further monopolisation of resources for producing our daily food” and “the legal chaos at the EPO”. No Patents on Seeds’ report also stressed the need for patents granted on processes of genetic engineering to have their scope confined to the specific technical processes. Patents that cover the process of conventional breeding, as well as on plants an animals derived are prohibited by rule 28(2) for the interpretation of the European Patent Convention (EPC). According to the report’s findings, around 60 new patent applications covering conventionally bred plants were filed, but none were granted to companies Bayer, Syngenta, or DowDuPont, who have allegedly broken rule 28(2) of the EPC with plant-related patents at the EPO on previous occasions. No Patents on Seeds alleges that the EPO “was afraid of further public protests against these patents and therefore refrained from granting them”. The group’s report stressed that EPO president António Campinos “needs to stop ongoing proceedings to ensure that no further such patents are granted”.